Atlanta has a vibrant local farmers market scene! And they regularly draw some of Atlanta's finest chefs. 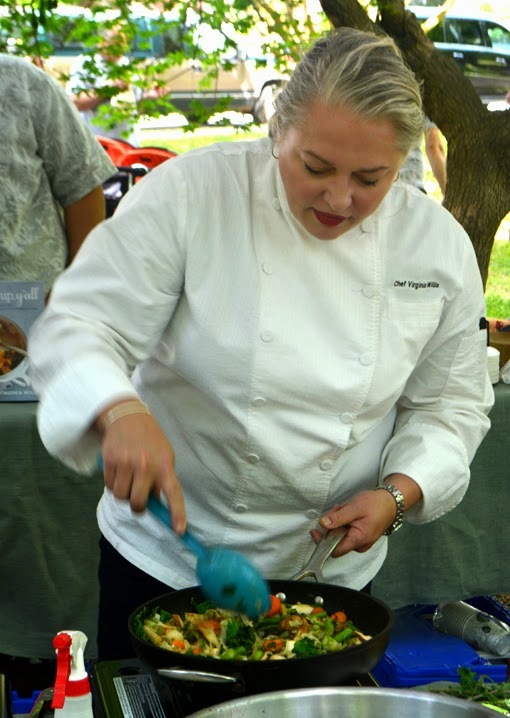 Last weekend I had the pleasure of seeing Chef Virginia Willis at the Grant Park Farmers Market. She's one of my favorite chefs and that's one of my favorite farmers markets...it was a great morning! I've said it before, but allow me to share again. When I travel, I love it when I come across a farmers market or a festival featuring local farms. That's why I'm writing about something not on the standard tourist itinerary...but I think it's a wonderful way to experience some delightful Southern hospitality and some local fare! 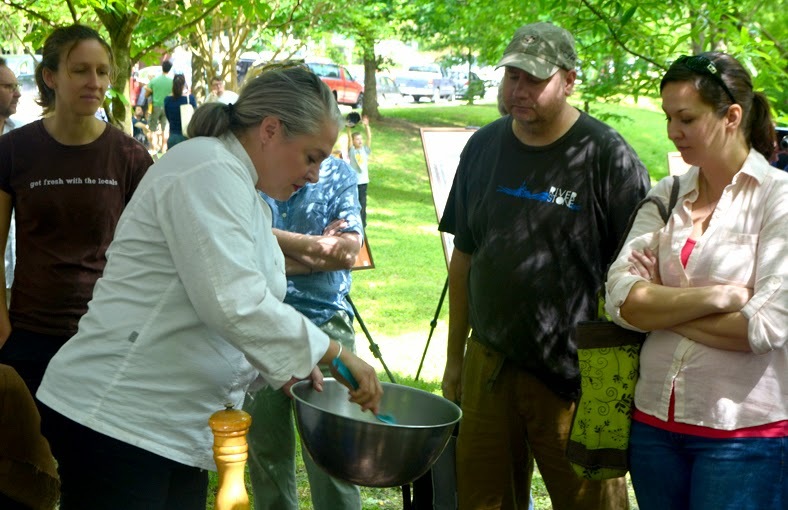 The first time I met Chef Virginia, in-person, was when she was a speaker at an event at the Atlanta Botanical Garden. She was then promoting her cookbook "Basic to Brilliant, Y'all". I've seen her at various events over the years, but last weekend was the first time I'd seen her do a cooking demonstration...I was super excited! Before the cooking demonstration started Chef Virginia went around to the various vendors at the market and purchased the ingredients for her demo, so her "Southern Stir-fry" was fresh, fresh, fresh! 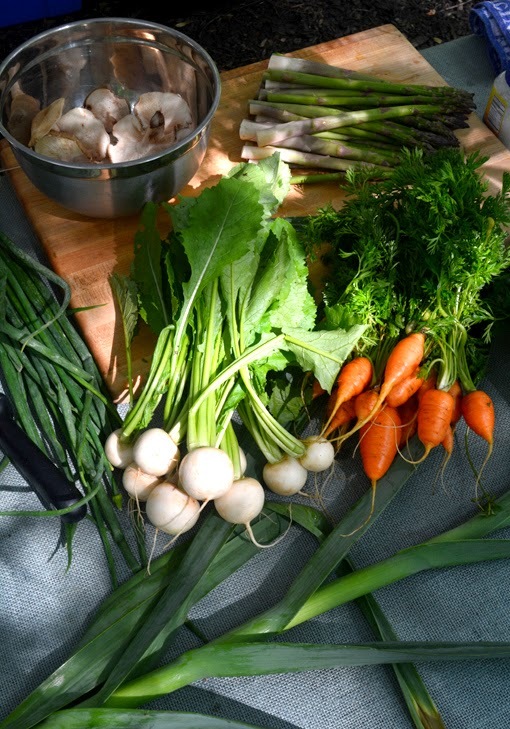 Grant Park Farmers Market has some awesome vendors, too many to write the full list here, but a few of my personal favorites are Preserving Place, Riverview Farms, Pearson Farm, Watsonia Farms, The Little Tart Bakeshop, King of Pops and Banner Butter! While Chef Virginia is entertaining—she's truly quite hilarious—she's also quite serious about knife safety. As she told us, "You only cut off your thumb once." She tucks in her thumb when chopping and slicing...and she still has two! Sage advice, evidently. On the day of Grant Park Farmers Market season opening it was raining, yet there was still an awesome turnout! On the day Chef Virginia was there, last Sunday, it was gorgeous. You saw, and regularly see, friends catching up, kids playing in the grass, young people on dates, others walking their canine companions and there there are awesome cooking demonstrations. I love that many of our farmers markets have chef demos and that they feature such high-profile chefs. When I'm on the fence about visiting a market—and we all are at some point—it can be a celebrity chef like Chef Virginia that motivates me to go. And when I call Chef Virginia a celebrity chef, she truly is…she's worked on more than 1,000 episodes of television food shows—with the likes of Martha Stewart, Bobby Flay and Nathalie Dupree—as well as being a cookbook author, photographer, writer and so much more! I also was impressed with how much Chef Virginia engaged with her audience. She welcomed all questions, she walked around what she was working on so everyone could see, and she even came into the audience! Nice touch, Chef. 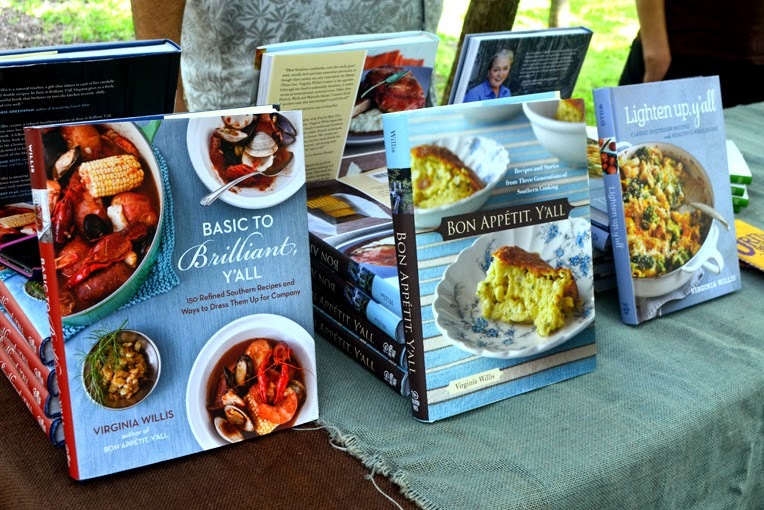 Of course I recommend picking up one, or more, of Chef Virginia's cookbooks, but also treat yourself to her blog, where she shares personal stories and amazing recipes. I mentioned that Chef Virginia is a member of Les Dames d'Escoffier International (LDEI) - Atlanta Chapter, and indeed she is. If you're local, you may know LDEI-Atlanta through the annual event Afternoon in the Country. This huge event, which sells-out every year, features chefs from Atlanta's top restaurants, paired with some of the area's best farms, all set up in a tasting format alongside fine wines and premium micro-brews—all under festive big-top tents in the beautiful gardens surrounding The Inn at Serenbe. In addition to the ample tasting and sipping there's live music, an awesome one-of-a-kind cake raffle (Seriously, it's awesome! ), hayrides, children's activities and a silent auction. This event supports LDEI-Atlanta's philanthropic mission to further the careers of women in the culinary arts. LDEI is "a worldwide society of women dedicated to creating a culture in the community that fosters excellence and promotes the achievement of women in culinary professions through educational and charitable activities." This is one of the brightest, most engaged and absolutely delightful group of professional women you'll ever meet. I'm proud to say that several members of the Atlanta chapter are friends of mine. 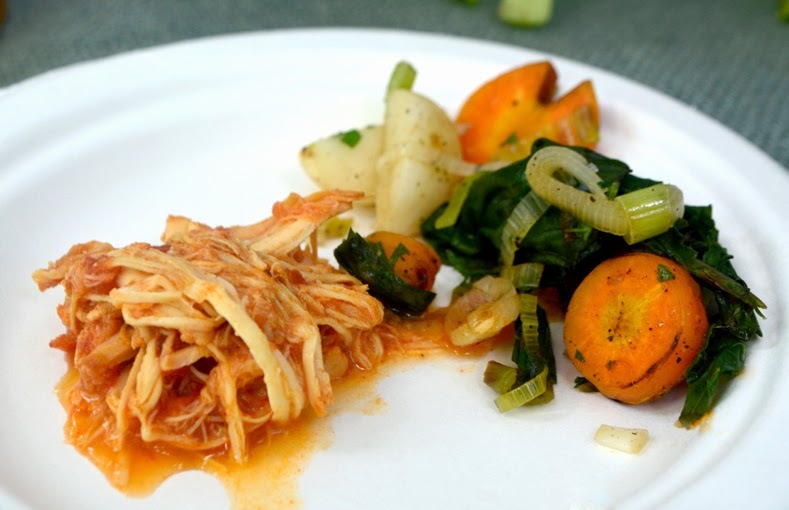 Chef Virginia brought with her a big pot of a pulled chicken recipe from "Lighten Up, Y'all" and served it with tastes of her Southern Stir-fry, made from fresh veggies she'd just picked up from the day's market vendors...both dishes were incredibly delicious! 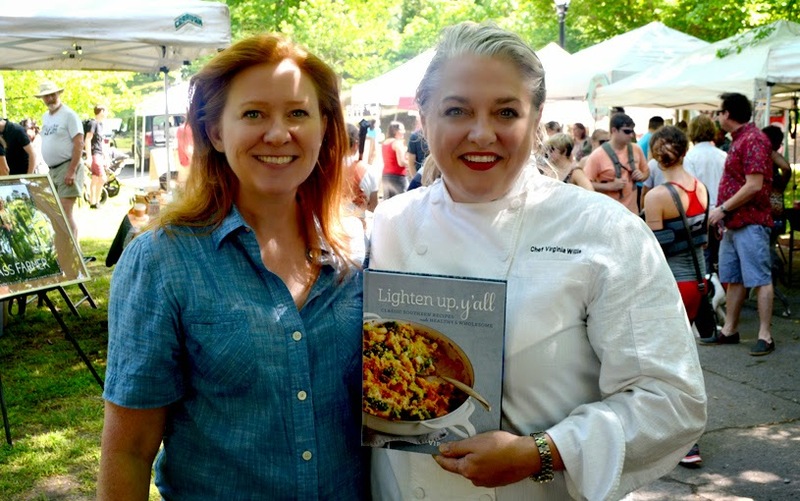 So, while Chef Virginia is on a national book tour, promoting "Lighten Up, Y'all", you may not see much of her in Atlanta, unless you spy her at the airport—you can't miss her striking beauty or her signature deep red lipstick! 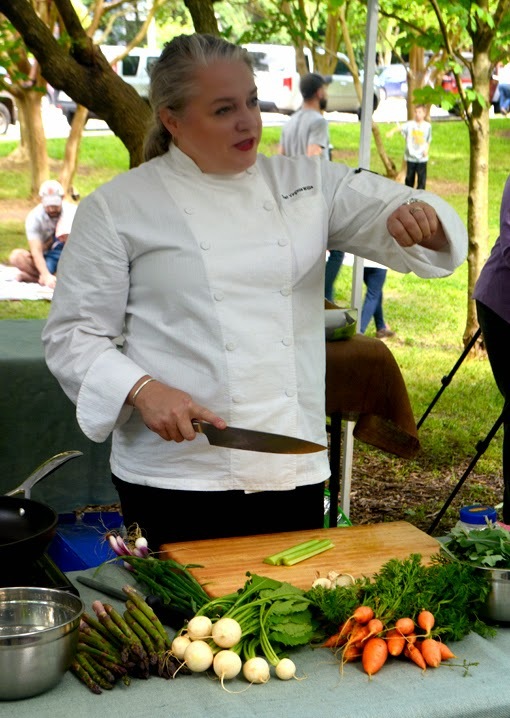 Chef Virginia will be at this year's Atlanta Food & Wine Festival, taking place May 28-31, 2015, in Midtown. And you can check out her Events page to see where else you can see her. I truly do enjoy going to local farmers markets and each one in Atlanta has a unique vibe. I get around rather a lot, so I've enjoyed quite a few. It's extremely rare that I leave a farmers market empty-handed—which may have never happened at all—but there have been times that I've arrived home empty-handed! And you can enjoy breakfast and/or lunch at a lot of our farmers markets. When I shop at Grant Park Farmers Market it's usually for ingredients that I'm going to use that evening. When you're at this particular market, while you're shopping you can enjoy coffee, fresh-squeezed juices, pastries, crepes, burgers and popsicles! Oh, and there are vendors for your four-legged friends, too. 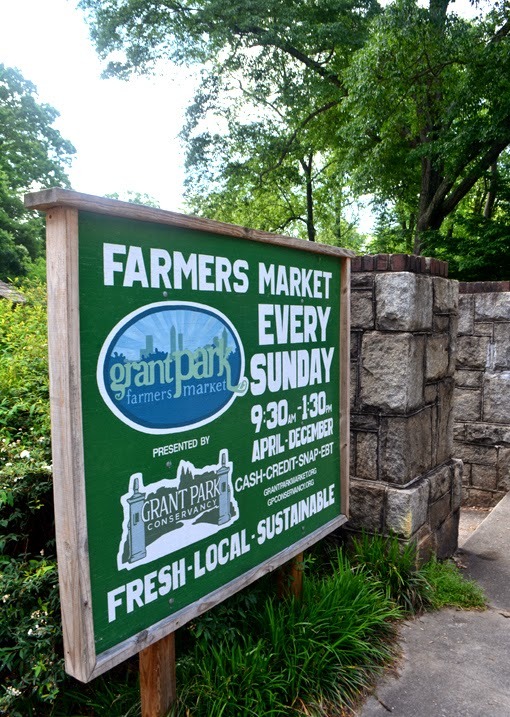 I mentioned that Grant Park Farmers Market is one of my favorites, and it is, and not just because The Little Tart Bakeshop is there either. The neighborhood locals are awesome, too! Every time I go, either on my own or with friends, it's always a great time! 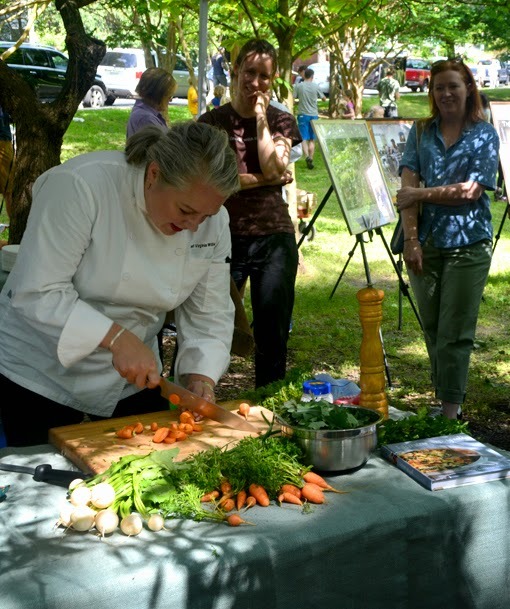 And the celebrity chef sightings, like Chef Virginia Willis, make the experience all the more fantastic! 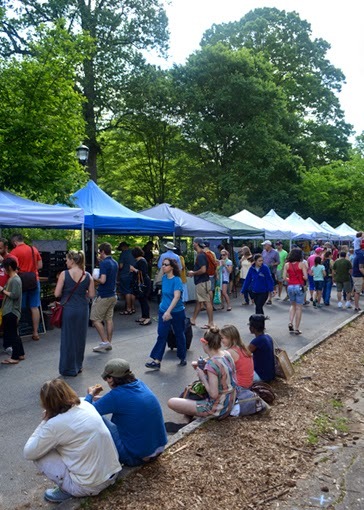 So, whether you're visiting or you're a local, when you're out wanderlusting in Atlanta, check out some of our amazing farmers markets...they're a real treat! The Art of John Lennon...in nearby Roswell! Unwired Magic Formula...LEGOs & Local Beer!